Richard Moore has personally thanked the participants for this amazing achievement and triumphant success. It never ceases to amaze the lengths in which people are willing to go to support charity, particularly Children in Crossfire. Because of these people, we are able to help those who need it most. Thank you. An incredible group of 28 cycling Celts took part in this historic event, which saw the Bhoys and Ghirls depart from Celtic Park and make their way to Portsmouth, before catching the ferry to Santander. The group then cycled through Spain, before finally arriving in Portugal at the hallowed site of the Estádio Nacional stadium in Lisbon on Thursday, May 25, 2017. As well as commemorating this historic day for Celtic and the Lisbon Lions, the cycle, led by supporter Paul Muldoon, raised funds for three charities close to the hearts of the participants – Celtic FC Foundation, Irish charity Children in Crossfire and Solving Kids’ Cancer. They have currently raised £46446.67! There is still time to show your support! 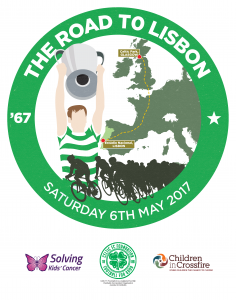 The Cycling Celts have raised £46446.67. We need your help to reach £50,000. You can support their monumental efforts by donating online or by texting LISB17 followed by £1, £5 or £10 to 70070. The money raised from this event will have a significant impact on vulnerable children in Tanzania and Ethiopia. Children that don’t have access to food, water, medicine or education. It’s wonderful that in celebrating Celtic’s amazing victory 50 years ago, that the organisers are helping create a legacy which will change the lives of so many vulnerable children.